What if your technology and services could adapt automatically to changes in student performance or behavior to provide the right guidance and advice at the right time? This is the promise that machine learning and predictive analytics hold out to higher education today. That’s the power of people and data working better together. 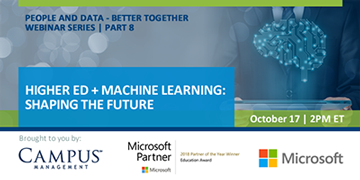 View this on-demand webinar that explores how CampusNexus from Campus Management delivers on the promise of machine learning. Ray leads product strategy and management at Campus Management, aligning solutions with the needs of higher education, including the development of the Occupation Insight Solution. He joined Campus Management in 2011 after nearly two decades of leadership at a private university in the southwest as the Director of Technology. He holds an MBA in Technology Management from the University of Phoenix. Eric Wellnitz is the Vice President and Chief Architect at Campus Management, and has served in this capacity for over four years. In this role, he has re-architected the Company’s solutions using Microsoft stack technologies as well as object-oriented design methodologies. He also leverages his knowledge of the software development lifecycle and SCRUM methodologies in his day-to-day management of the Architecture and Development Operations teams.